Perhaps it’s the late January release date, but Sunless Skies puts me in mind of The Polar Express. In the standout scene from Robert Zemeckis’ Christmas fairy tale, the titular train steams out across a new lake that has frozen over its tracks, setting the engine loose from its predetermined route. As the Express careens across the ice, its coaches jackknifing uncontrollably, Tom Hanks shouts down instructions to the engineers (“LLLLLEFT! RRRRRIGHT!”), who steer hundreds of tonnes of screaming steel back on course to connect with the rails on the other side – like astronauts docking with the ISS, just louder. 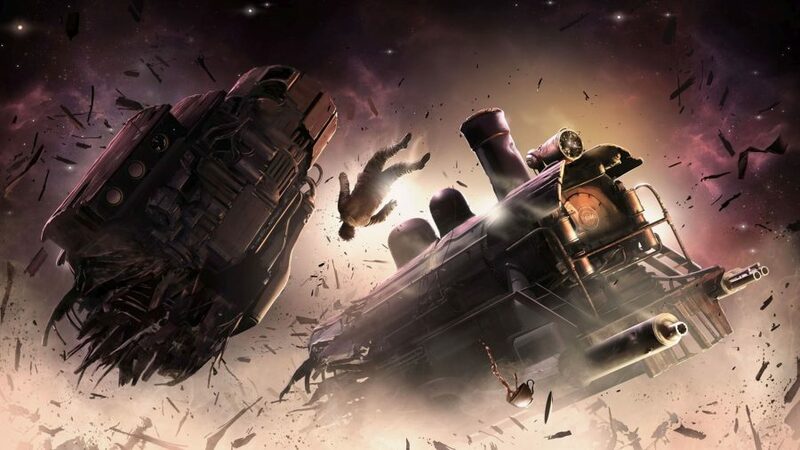 There is nothing more terrifying, little more exhilarating, than a train free of its tracks – and in Sunless Skies your locomotive only meets the rails when it reaches the engine yard of a friendly port. For the majority of your playtime, your wheels spin above countless fathoms of air as you set your own course through the unmapped heavens, one bulging eye on your fuel counter. You might have noticed that I’m skipping back and forth between the language of the railway, the stars, and the sea, and that’s because no one of them entirely encapsulates the premise of Sunless Skies. You captain what is unmistakably a steam engine, leading a crew of not-quite-cosmonauts, not-quite-pirates in a series of mercenary acts – transporting settlers to new homes, trading weapons for flowers, shooting down enemies of Her Renewed Majesty and harvesting their nameplates like scalps. By making increasingly bold trips through the sky to distant ports, you might just pull together enough coins – not only to patch over the holes in your locomotive and replace the crew you’ve lost, FTL-style, but to buy bigger locomotives, and maybe even keep your crew alive long enough to make the return trip. Maybe. Baby steps. This is life on the frontier, but not in the American model. Upon reaching the High Wilderness, Londoners colonised it the only way they knew: building cramped dens of industrialism, recreating class division among the stars, and continuing to compete for Best Kept Village on floating islands. This might be the only vision of space in which the pioneers prioritised cricket pitches and apple orchards over mining stations. 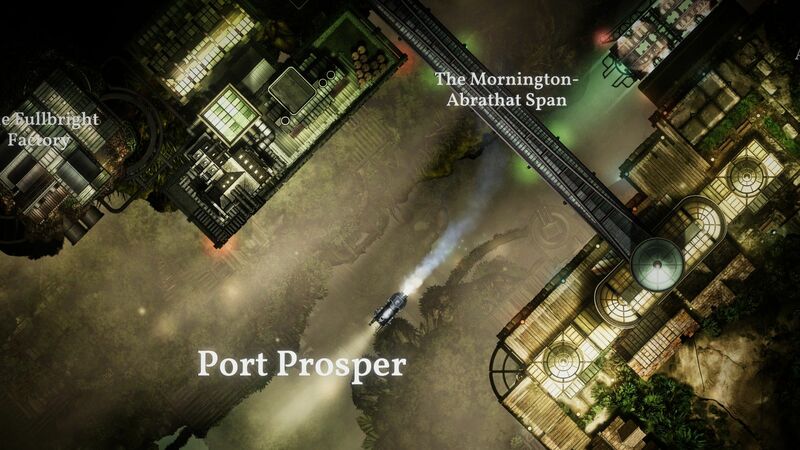 Some of Sunless Skies’ ports have their own, unique mechanics. Port Avon’s is the very British idea of ‘wearing out your welcome’ - sitting in the pub or at the back of church longer than any appreciative tourist ought to. To regain entry you’ll need to bring gossip, or invite the residents aboard for a cup of tea, sourced at great personal risk. In short, it’s the wildest bit of worldbuilding this side of Torment: Tides of Numenera. The Sunless series is often bunched in with roguelikes, but it’s only optionally that way – you can pick to reload from your last port after a death, rather than start over. Better to think of this game as a great novel stowed away in the hold of Sid Meier’s Pirates!, or an RPG reconfigured entirely around the writing – though not one that shrinks the scale, as Subsurface Circular did. Sunless Skies developer Failbetter cut its teeth in the choose-your-own-adventure revival that washed over phones and browsers. That perspective shows in every aspect of its new game. Where conventional RPGs have often struggled to squeeze meaningful choice and storytelling around the perennial gameplay loops of the genre, Failbetter solves the issue by transforming every part of that loop into an opportunity for further storytelling. Leveling up alters your stats, but its primary allure is the chance to add another paragraph to your backstory – perhaps one informed by a recent brush with gravity, or a run-in with temporary madness. Combat, a simple yet tense naval-esque affair about charging and dodging in real-time, is more often than not a prompt for a new quest. Scuttle a marauding ship and it might yield a sky-frazzled pilot who needs taking directly to Magdalene’s house of comforting lies, or perhaps Carillon, the demonic spa for the soul. Stories? They’re quite literally the objects in your inventory – Sky-Stories and Tales of Terror you can trade at port. Perhaps Sunless Skies’ best trick, inherited from Failbetter’s Fallen London, is to turn practically everything into currency. Anything can be normalised if it can be bought and sold, lending the game a surrealistic air in which you might take extra risks on behalf of your crew, knowing that the resulting anecdote might prove valuable someday. There are bugs, however – and I don’t just mean the singing Chorister Bees poised to invade the bohemian retreat of Titania (in fairness to the musical insects, the place is nestled inside a flower the size of the Sydney Opera House). On a few occasions, the music cuts out entirely – a shame when such great efforts have been made to give ports distinctive motifs, adding to the sense of relief when a familiar theme kicks in just as you load up your last fuel tank. More than once, the game stops registering half the buttons on a controller, too – trapping me in menu navigation until I resolved to quit out entirely. The game does warn that untreated terror could lead to Nightmares, but I presumed they’d stay in-game. I am only really upset, though, when those bugs mean I don’t get to see the end of one of Sunless Skies’ interactive short stories, which are quite simply the best in the business. 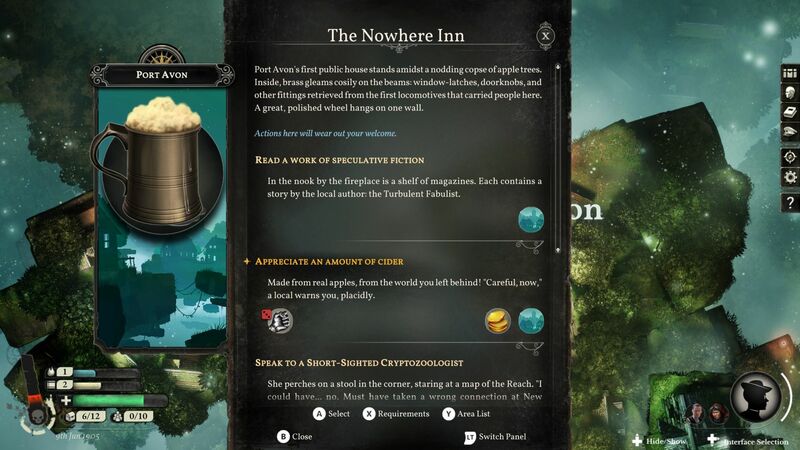 Each port is a book with a tone unto itself – there’s Port Avon, the satirically comedic Little English idyll where locals are impeccably polite but soon harden to outsiders, and Traitor’s Wood, a creeping, gothic mystery where a three-headed fox in a Giggling Cave speaks to me in the voices of my crew. Yup, still working on the ‘keeping crew alive’ thing. 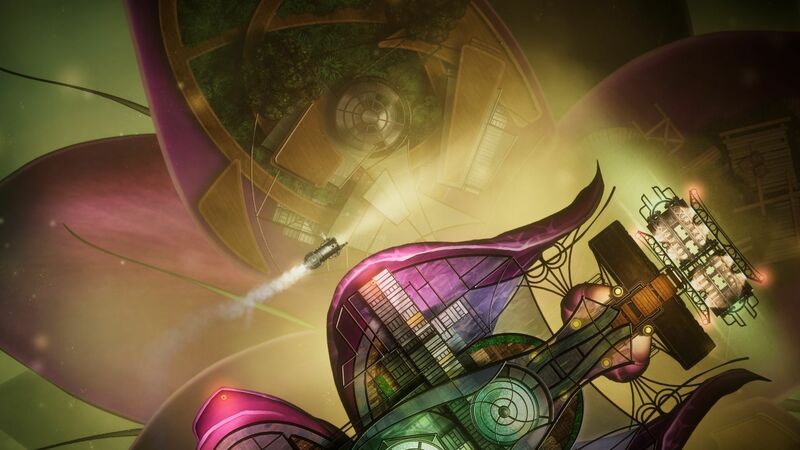 It feels trite to say that Sunless Skies has really good writing – the game is its writing, removing as many obstacles as it can between you and the prose, letting you see the scene unfiltered by camerawork, animation, and voice acting. Just to be really clear: that means a lot of reading, but it’s worth it. The things you’ll see in your mind’s eye here will outstrip anything you watch in cutscenes this year. The stories of Sunless Skies are droll, profound, and capable of causing you to laugh in shock – as when, upon seeing your first officer, the Incognito Princess, a bystander calmy removes a spoon from his pocket and scoops out his eyes (“After such radiance, all else is tawdry!”). They are terrifying and exhilarating. Failbetter has left the rails of storytelling, and PC gaming in 2019 is better for it. Failbetter continues to revolutionise the RPG - not by burning it all down, but by slipping pages of prose into every crevice it can.